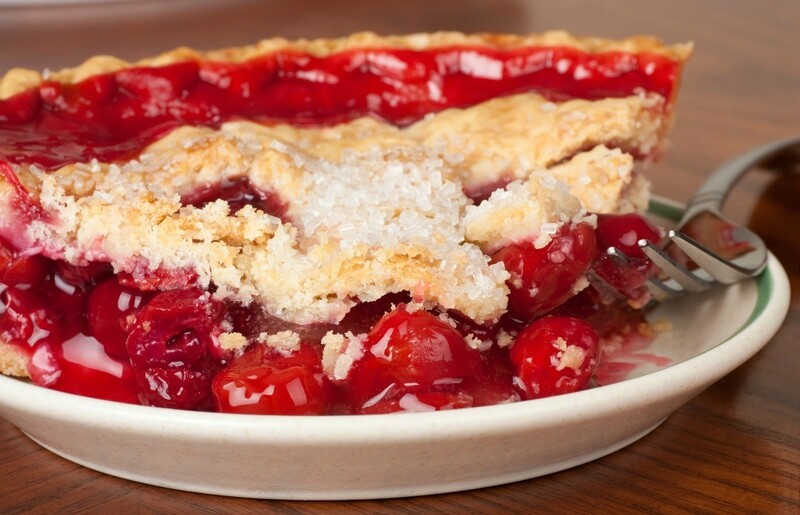 Using canned pie cherries, cream cheese, and a pie shell, you can easily create a fabulous pie. This page has a cherry pie supreme recipe. Preheat oven to 425 degrees F. Prepare pie shell. Spread half of cherry pie filling in bottom; set rest of filling aside. Bake shell 15 minutes, or just until crust is golden. Remove from oven. Reduce oven temperature to 350 degrees F. Meanwhile in small bowl, with portable electric mixer, beat cream cheese with sugar, eggs, and vanilla until smooth. Pour over hot cherry pie filling; bake 25 minutes. (Filling will be slightly soft in center.) Cool completely on wire rack. To serve: spoon sour cream around edge of pie. Fill center with remaining cherry pie filling.